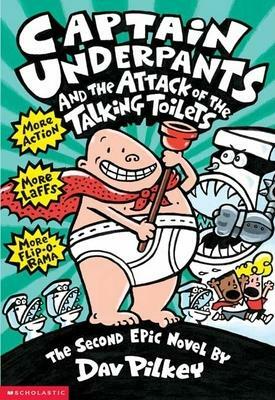 The second book in Dav Pilkey's mega-bestselling Captain Underpants series. Now with super-cool foil covers! Shiny! Fun! George and Harold are usually responsible kids...whenever anything bad happens, George and Harold are usually responsible! And it looks like they're up to their old tricks again! First, they ruined the school's science fair with a series of silly pranks. Then, they accidentally created an army of evil, vicious, talking toilets, intent on taking over the world. Who will stop the carnivorous commodes?!!!? This looks like a job for Captain Underpants!